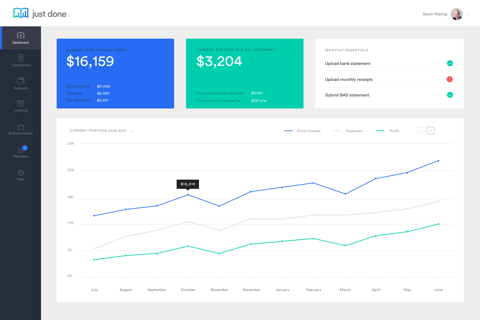 Just Done is a virtual accounting platform that does it all for the self-employed. Freelancers, contractors and tradies can forget about juggling paperwork with full time jobs, risking tax debts and late submission penalties. Just Done provides an end-to-end solution for all your accounting and bookkeeping needs, from invoices to BAS and tax returns. Money in and out is displayed on an online dashboard that’s easy to ready and secure. Best of all, there’s a real qualified accountant behind the screen crunching the numbers for you.